I am still pursuing any Peyton-Boswell connections which might have existed in Prince William County, VA.
Our Edward Boswell and his brother, Hazekiah Boswell, shared the given names of Craven, which are also shared by the Peyton Family of Prince William. My Edward witnessed and proved the will of Henry Peyton in Prince William County, along with Valentine Peyton. This last will and testament of Valentine Peyton Gent., deceased was presented to the court and being proved by the oaths of Harrison Peyton was ordered to be Certified and at a Court held for the said County the 6th day of March 1786. The same last Will & was proved by the oath of John Cannon and admitted to record Burr Peyton an executor therein named having made oath to the same and performed what is usual in such Case-Certificate was Granted him? for obtaining ? probate thereof in due f? ?ding signatures off edge of page well, the copy job wasn’t the best. the original was light in places, and didn’t fit 8×10. Thomas Leachman was son-in-law to Edward Boswell. I will welcome any small bit of information which might contain the names of these two families within the same document. John – Somewhere along the way, I have seen that sometimes the name “Bussell” was used interchangeably with “Boswell”. Never heard of any of these people your talking about but now Im interested. Thanks Neddy and Will for your comments and interest. Interestingly, there was a Peyton Boswell who had written and published numerous books on art history and specific artists, from the period of about 1920-1950. I am attempting to locate the origins of this Peyton Boswell, as it seems too coincidental for it to be such, if that makes sense. It appears that there were Boswells located early in York County, VA, and subsequently in Lancaster County and Gloucester County, which were set off from the original York County. It is pretty well known that many folks from Lancaster moved up into the northern neck of Virginia (including Prince William) when the Indian problems were settled down, and it seems reasonable that the Boswell family was no exception to this. There were at least two elder Edward Boswells in the Lancaster County, VA area. One supposedly returned to England late in his life, where he died. The other Edward is mentioned in documents which still placed him in the area. What is necessary at this point is to find the paper trail which would link him to Edward and Hezekiah. Lancaster County was formed from some of York County, as also was Gloucester County, so the areas involved are relatively close. Imprimis that ye sd. Samuel Cole doth promise agree & ingage with ye sd. Psh. of Lancaster to serve them in ye office & function as Minister every other Sabath so long time as he shall remain in this Colony. It. That he will fulfil p:forme & duly officiate all Christenings burials marriages Churchings & what else is proper to his office & ministry in ye sd. Parish. It. It is agreed & concluded on by ye sd. Samuel Cole & ye major part of ye Inhabitants now met together that a Church shall be built with all convenient speed on Mr. Boswells Point & that ye Vestry now made choice of shall take care for ye effecting of ye same. Lastly, it is agreed & concluded by ye sd. Inhabitants of ye Psh. of Lancaster as aforesd. to pay unto ye sd. Sam: Cole ye full sum of Four thousand pounds of good tobo: in cask yearly & every year so long as ye sd. Sam: Cole shall serve & officiate in ye office & function of Minister in ye sd. Parish, likewise to contribute & agree with ye Inhabitants of Pianketank for selling of a Glebe & buying a House for ye sd. Mr. Coles better conveniency to officiate & serve both Pshs. of Lancr: & Peanketank & for ye p:formance thereof ye sd Sam: Cole & these under written by consent as above sd. haveinterchangeably subscribed ye day & year above written. & these under written chosen for Vestrymen of Lancr: Psh. Record 15d Decem: 1657 p Edw. Dale, Cl Cur. I am interested in determining if the Peyton family had a similar migration pattern prior to their settlement into Prince William County, VA. I noticed several folks of both Boswell and Peyton families liste in this inventory. The dates of about 1730 to 1760 are the general time frame and this increases the possibilies of the two families having shared other residential similarities. I am not sure how much additional luck there will be identifying other records which might reflect mutually on this two families. Thanks John Fox for the great link to Gloucester County, Virginia information. Yes, there are many indications of relationships between the families of Gloucester County and of the Northern Neck. 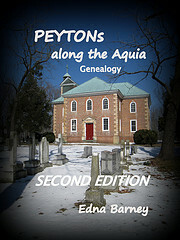 Although there are many documentations as you cited with families connected to the PEYTONs coming from Gloucester to the Neck, I do not know of a proven connection yet with the the PEYTONs of the two regions. However, I feel strongly that there had to have been one. I have two lines of PEYTON ancestors from Culpeper and Prince William, and they married into the Gwyn and Whiting lines from Gloucester. I do appreciate your interest and comments on my postings. I just find it too much of a coincidence that Valentine Peyton and Edward Boswell proved the will of Henry Peyton, and both Valentine and Edward had sons named Craven. Craven Boswell, who was my ggg uncle married my gggg aunt, Rebecca Elizabeth Windsor in Caswell County, and settled into Henderson County, KY. My ggg grandmother, Catherine Boswell Graham, sister to Craven, also had a son named Craven. There are many other instances of the given name in the Boswell family to make this a compelling issue to investigate. of R. and J., born Sept. 22,1848 4) Robert Gwynn married Judith Wynn Feb.
1883; Hugh Gwynn died May 1912; Martha Sadler Gwynn diedDec. 1904; Wm. July 1907; Corrie Peyton Gwynn died Feb. 1904; Robert J. Gwynn died Jan.
Augustus Gwyn to Jane E. Madding, Jun. 2, 1838, Thomas Swift bondsman/witness. Augustus Gwyn to Emily T. Corbitt, Jun. 21, 1854, Thomas D. Atkins bondsman/witness, marriage performed by Ed Jones JP. Daniel Gwyn to Mary N. Hatchett, Aug. 30, 1815, Zadok Rice bondsman/witness. John Gwyn to Permelia Dupree, Aug. 2, 1839, Rice Gwyn & Geo. W. VanHook bondsmen/witnesses. John W. Gwyn to Frances Hornbuckle, Sept. 14, 1856, Benjamin F. Williamson bondsman/witness, marriage performed by Thos. J. Williamson. Jones Gwyn (col.) to Phillis Watlington (col.), Dec. 31, 1866, George Watlington bondsman/witness, marriage performed by Stephen Neal JP. Rice Gwyn to Elizabeth B. Rice, Mar. 1, 1842, Abisha Slade bondsman/witness. Robert Z. Gwyn to Nancey Corbett, Nov. 29, 1859, Pinckney Gwyn & Allen Harrelson DC bondsmen/witnesses. Zeri Gwyn to Temperence Goodson, Dec. 21, 1800, Ziza Rice bondsman. My name is Steven Williamson from Waseca Minnesota. Elijah Gwyn is the mother to Rhoda Gwynn Bradford Williamson and married John Williamson. Their son Edward Thomas Williamson (Civil War drummer and later shot in hip but survived) would be my Great Grandfather. He had a Step-brother Thomas Bradford and settled in Fulton county, Illinois. As far back as I have gone is David Gwynn, but there are several stories about Hugh Gwynn being involved in the colonial development of America and he had died in Wilson County TN. I would appreciate any further information to confirm the interesting history of John Williamson and Rhoda. There was a Ransom Boswell who also settled into Caswell County, NC. This Boswell had ties to Gloucester County; he lived quite near Edward, and had a son or grandson named Hezekiah, but not the Hezekiah who I believe is the brother to Edward who also has the Craven names in his line. Thanks John. The Caswell County connection is most interesting. Also, the Hugh Gwynn and Peyton Humphries you mention are very interesting to me, as I believe they are the ancestors of my Guinn whose daughter married a PEYTON in Culpeper County. My PEYTON family in Culpeper and Spotsylvania Counties were connected with the Humphries or Humphrey family. It will take a while to get through all the info you have sent. I will reply here when I do. I think there is an RSS feed for these comments. John, Edward BOSWELL was not an executor of Henry PEYTON’s will, as far as I can deduce. He was a witness along with Valentine PEYTON. The executors were James EWELL, John PEYTON and Cuth’ BULLITT. on November 6, 2006 at 6:09 pm | Reply Humphries, George W.
Am searching the lineage of a Geo. Wash. Humphries of Caswell Co., NC who died and left Will dtd. 1796. Names a Nancy Humphries who mar. John Middlebrooks. A John Middlebrooks married Nancy Humphries on 1781 (Jan) in Caswell Co., NC. Does this Geo. W. come from Spotsylvania Co., VA and what became of Nancy Humphries and spouse John Middlebrooks? I am A Middlebrooks descendant of Isaac b. 1727 New Kent Co., VA and the Boswell lines marry in VA to the Nathaniel Middlebrooks clan of Orange Co., VA.
Can anyone help shine light on this Geo. W. Humphries line..who was his spouse? Where is he buried and where is his land located in CC, NC? Thanks so much..can share Middlebrooks info. My Mother is the Middlebrooks, we are from the Thomas Mids – b 1763 in Caswell Co., NC. I see you said you are a descendant of Isaac b. 1727 New Kent Co., VA. Is this Isaac John Middlebrooks that lived in Caswell County, NC, who married s Ann Sims? Some are saying this is our John Middlebrooks. Will you please share Middlebrooks history? I do not have any Middlebrooks in my data base, but I do have an ancestral cousin, Mary Sims who marred my GGG uncle, Thomas Boswell who was born in Prince William County, VA and lived in Caswell County, NC. Mary Sims was a daughter of George Sims and his wife, Zebiah Rice who was my second cousin 6 generations back. George Sims was born 12 December 1740, possibly in Hanover County, NC; Zebiah Rice was born 3 December 1747 in Louisa County, VA.
Is there any links of your Ann Sims to the above? The interplay among families mentioned on this site is most interesting. One Boswell family of Caswell County used the given name of Ransom quite frequently. They lived near the Edward Boswell family in Caswell. No documents connect the two families, although I believe they may have been linked in earlier generations. I don’t think this James m DUDLEY. However, there is a lot of connection between the families. In the late 1600’s, Elizabeth RANSOM3 [George, Peter1] married two Robert DUDLEYs. The first, Maj Robert DUDLEY, died in 1701, and named his brother as Ambrose DUDLEY, his father as Richard DUDLEY. Elizabeth’s uncle, James2 RANSOM is probably the man to whom you refer; he is usally linked with “Mary BALDWIN of the PEYTON family”, although I’m not sure we know who his wife was, with proof. In the late 1700’s, Susan or Sukey DUDLEY6 [George 5,4, Ambrose3, Richard2, Edward1] married Robert RANSOME. Her sister, Betsey DUDLEY, m Capt Peter BERNARD, in whose Rev War company served Lt Thomas RANSONE. This is detailed in “Virginia Soldiers of 1776” by Louis A BURGESS, pp 60-65 [BERNARD] and 343-348 RANSONE]. A Hugh Gwyn of Mathews County, VA, vestryman, was married to Peyton Humphries before 1738. Peyton Humphries was born in Gloucester County, VA ca 1715. Their son, Hugh, Jr. married mu 5G aunt, Sarah Rice in Caswell County, and had among their progeny, eldest son, Ransome Gwyn. I have been searching the Boswell hertiage for the past 5 or 6 years, thanks to ancestry .com I have foud a lot of information on all the family. There were only three brothers that came over from the old country we’re Scotch -Irish the brothers settled in va. and nc and then spread from there to the south,west and north . My family is from perquimans co. orig. where the thomas boswell family settled in 1712. he was the son of thomas from Gloucester va. 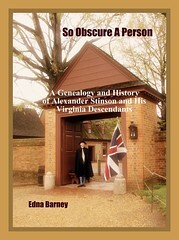 I can send you a copy of the findings from 1645 when the original thomas came to va.. There were 2 other boswells who came over they were william and Henry , they settled in rappahannock co. va..
Boswell came to VA. as he has record of. How might I contact him? My mother is a direct decent of John Winfrey Bowell from VA which everyone is confused on his date of death and his will and the 980 acres of land. That is my mother’s 7 generations back grandfather. And her great, great, great, great, great, great, great grandmother married William Gatewood after John Winfrey Bowell death in Sportesylvania, Va. I am interested in the Gatewood Family and any other information you can provide. Donita, I believe you are referring to the John Boswell who died in 1741 in Spotsylania Co VA, leaving a will and naming his wife Ann, and his children. I have not seen this John named as John Winfrey Boswell. Do you have a source for his full name? the Winfrey could be significant as that could indicate an ancestral family name. What I recall in the record of Henry Peyton’s estate was that Edward Boswell and Valentine Peyton were called into court to prove the will of Henry Peyton. The were indeed listed as witnesses to the will, and I suppose that they had to give testimony that they had witnessed Henry Peyton’s having signed the document in their presence. This is a very compelling event in that Henry may have been in his sick bed and had called these two men together to assist him in completing and validating the will and his signature. Thank you so very much for making these postings an integral part of your concerns relating to the Peyton family history. I just found these postings, very interested in the potential nexus between Boswell and Peyton families. The “Peyton Boswell” cited on previous post was my great-grandfather. I think my sisters may have some more information on his ancestry, will have to dig around a little more to see how far back that goes. I am very interested in your knowledge of this Boswell family. It just seems to be more than just a coincidence. Have you had any followup information from your family’s research? As I recall your Boswells were in Tennessee and then Kentucky before making it to Illinois and subsequently to New York. I have spoken to you before because I also descend from Edward Boswell through John Boswell & Kitty Simpson, through oldest son John Thomas Boswell. I thought the conversation here was interesting relating to the Gwyn Family which is also connected to me. My Rice Family was from Caswell Co, NC and Thomas Rice married Mary Bradshaw are my ggggrand parents in Wilson Co, TN. Their son moved to Gibson Co, TN to be Crockett Co, TN near My Boswell’s and both Rice and Boswell married into my Dye Family in Crockett Co, TN later. The Andrew Gwyn (son of Hugh) married THomas Rice’s Sister Esther Rice. Tom and Andrew hung out together and got in alot of trouble together with their scemes and scandals. Both were drinkers and commonly caused affrays around town. Gibson Co, TN after his father died in 1849 of Cancer. His Daughter Sarah Ann Rice married John Dye in 1879 in Crockett Co, TN… John Dye’s Sister Elizabeth ” Lizzy” Dye married Napoleon Boswell the son of John Thomas Boswell and his 2nd wife Elizabeth Pully whom are buried at Quincy Cemetery in Crockett Co, TN. Tom’s first wife was Sarah, daughter of Roger Simpson son of Aaron Simpson of Caswell Co, NC, and Neice of Kitty Simpson Boswell. Napoleon Boswell was my gggrandfather and Sarah Rice Dye was my gggrandmother. All of this is very interesting and I would love to know how Edward was related to Ransom’s line. I am looking for informaition of Boswells of Prince William County Va.My Gx Grandmother was Susan Boswell b 1800. I have found a marriage of Susan Brammill to a James Boswell 1819 PW. James never shows his name again but Susan and her children stay in PW county. Can anyone help me find James and his family? I’ve been working on this line, too, for the past 20 years. It’s a bit of a doozy without much info on James and how Susan Boswell was a pauper by 1860. Her daughter(-in-law?) Mary Jane is also confusing. Feel free to contact me so we can share what we’ve found so far. jacqamidon at gmail dot com. Where would I find this proof? You can start with the county records 1702-1763 to find the father and son connected. With so many Virginia records of that period lost, it is difficult.